The UK Government has given public support to Brazil’s bid for a permanent place on the UN Security Council. 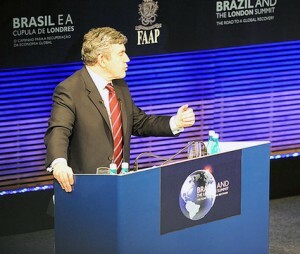 Speaking in Sao Paulo on Thursday, Gordon Brown said the case for the country’s permanent membership had grown steadily stronger and he was proud to support them. He added that Brazil and the whole of South America should be heavily involved in the current discussions on the future of the global economy, which will come to a climax at next week’s G20. Mr Brown visited Brazil with Trade Minister Peter Mandelson as part of a tour of countries taking part in the G20, in a bid to build consensus on major issues ahead of the summit. He met with President Luiz Inácio Lula da Silva in the capital Brasilia, before travelling to Sao Paulo to visit a football museum. Following the tour, the Prime Minister announced that the English Football Association and the Brazilian Football Confederation will team up to share expertise.